Though fictional in detail, Samurai X (Rurouni Kenshin in its proper Japanese titling) is based on historical Japanese events of the late 1800s, as the shoganite era of Japan came to its close. The 95 episode TV series, four OVAs and this feature film are based on the original manga by Nobura Watsuki. 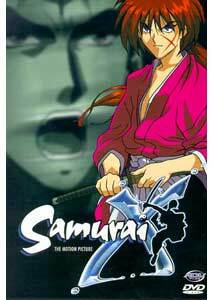 While the OVAs serve as a prequel to the TV series, Samurai X: The Movie takes place after it, and utilizes characters from the TV version. Kenshin Himura was a shadow assassin, better known as the Hitokiri Battousai (sword drawing master assassin) during the Bakamatsu, when opposing factions were fighting for the future of Japan. One side looks to preserve the country's traditions; the other welcomes western contact and an end to the caste system. In atonement for his history as an assassin during this time, Kenshin has vowed to never take another life, and now dons a Sakbato, a sword with its cutting edge reversed so it can't kill its opponents, and instead wanders Japan helping the weak, with only the X-shaped scar on his face as a reminder of his past. These journeys make up the stories covered in the TV series. The movie opens with a flashback to the last days of the Bakumatsu, as samurai warriors, led by a skilled young swordsman, approach a meeting place of their enemies deep in the bamboo forest. A battle erupts, with blood flowing on both sides. As the melee sends its participants to their violent deaths, this warrior faces up with Kenshin (Mayo Suzukaze), whose lethal swordplay cuts down the young man in a sea of brilliant red. We move forward in time to 1879 as Kenshin and his friends Yahiko Myojin (Mina Tominaga), Sanosuke Sagaro (Yuji Ueda) and Karou Kamiya (Miki Fujitani) arrive in Yokahoma to view the architecture and culture born in this new era when western influences, following the Meiji Resurrection, are becoming evident in the dress and feel of Japan. Traces of the past remain however, and a chance confrontation unites Kenshin with Takimi Shigure (Kazuhiko Inoue), another of the old school samurai, while he was defending Toki Takatsuki (Yuko Miyamura), whose brother was killed in the Bakumatsu. Resentment fuels continued political unrest, as factions upset with this modernized government attack the embassy that awaits the arrival of the first foreign diplomat to visit the country. It's a very delicate time in Japan and one that could be exploited by many. As events begin to unfold, the past once again comes back to haunt Kenshin, and he will have to find out whether he can keep his vow not to kill in the face of what is to come. For those who, like myself, have seen the OVAs, but have not yet seen the TV series, Samurai X: The Movie is a bit of a departure. First, there is a lot more humor injected in the form of deformed, over-emphasized facial reactions during the first half of the movie, which differ from the darker and more serious OVA presentation. The characters present in the movie are also based on the TV series, so may be unfamiliar, and their design is less serious and cuter than the OVAs. One issue that I found somewhat annoying was the seemingly constant revisiting of the film's opening battle sequence, which, while important to the plot and interesting the first time, became tiresome after the third or fourth viewing. The quality of the animation and backgrounds are wonderful, though not quite up to the standards of the OVAs. Detail is high, movement is fluid and the fight sequences are highly-stylized with aerial battles and slow motion swordplay. The degree of violence warrants the 17+ rating, while drama and bloodshed are high in this action packed feature film. Image Transfer Review: The 1.85:1 nonanamorphic transfer is near flawless. Colors are vibrant, with the blood in the opening sequence nearly florescent. Extremely minor aliasing in a few spots, and the odd bit of compression artifacting in a few select areas are the only real detractions to the picture. The only big disappointment for widescreen owners will be the fact that the subtitles fall outside the 1.85 frame, so you won't be able to zoom in on this and still read the text, which is a real shame. Audio Transfer Review: Samurai X: The Movie is presented in both original Japanese and English dub. Sound design utilizes the full stereo field with plenty of directional effects. The audio quality is highly suitable to the picture, full range and dynamic, with dialogue easily discernable. Extras Review: A bit light on extras, there are trailers for both the Samurai X movie and OVAs. Also accessable from the menus are trailers for Farscape, Shadow Raiders, Gasaraki, Evangelion, Orphen and Sin: The Motion Picture. The ADV mix trailer opens the disc. The first pressing of this disc inadvertantly shipped without the planned reversable covers (like the Samurai X OVAs have). There will be some kind of arrangement made to provide the intended double-sided covers, though plans are not yet finalized. While regrettable that this occured, I once again have to hand it to ADV for addressing the situation in order to make fans happy. If you enjoyed the OVA set, this is a must have addition. If you have yet to experience Rurouni Kenshin, it features highly-stylized action sequences, copious amounts of blood plus deep introspection of the characters. The movie is a little more light-hearted in the beginning, but the tone moves into the realms of drama by its conclusion. Although it could have used some tighter editing, especially the numerous flashbacks, it still warrants a look, and in my books is a highly worthwhile investment.